Staff Selection Commission (SSC) is going to conduct Re Medical Exam (RME) for GD Constable posts. The Re Medical Exam is scheduled to be held from 23.08.2016. Earlier Staff Selection Commission had completed the process of getting applications. For appearing in this test, aspirants have to download the admit card from below given link. The Admit card of SSC GD Constable Re Medical Examination had been released now. Those candidates who had applied, can download SSC GD Constable Medical Exam Admit card from below. The Commission had processed and declared the result of written examination and list of candidates shortlisted for Detailed Medical Examination (DME) will be given to MHA/Co-ordinating CAPF i.e. CRPF. Now SSC is going to conduct Re Medical Exam in upcoming dates for 62390 Constable (GD) posts. For that, admit card had been released now. Also Eligible / ineligible candidates list will also be released. SSC GD Constable Exam date: The Re medical examination (RME) are starting from 23 August 2016. Admit cards had been released on 02 August 2016. Candidates have to download SSC GD Constable Medical admit cards from the official website ssc.nic.in via the direct link given below. The medical examination will be held at various centres. The candidates should not have any defect like squint in eyes, knock knee, flat foot, varicose vein. Their eye sight should be better as mentioned in notification or above below image. They should have sound mental and physical health for duties in all places. They may be placed to serve (after appointment) in high altitude and border areas with extreme climatic conditions. During DME, the collection of documents from the candidates and their verification will be done by the CAPFs. All the important details like exam venue, roll number, date and time etc. had been mentioned in them. Earlier Staff Selection Commission had invited applications for GD Constable posts. MHA/CRPF will issue call letters and conduct DME and Review Medical Examination (RME) in upcoming days which you can download from below given link. The recruitment process will consist of Physical Standards Test, Physical Efficiency Test, Written Examination and Medical Examination. 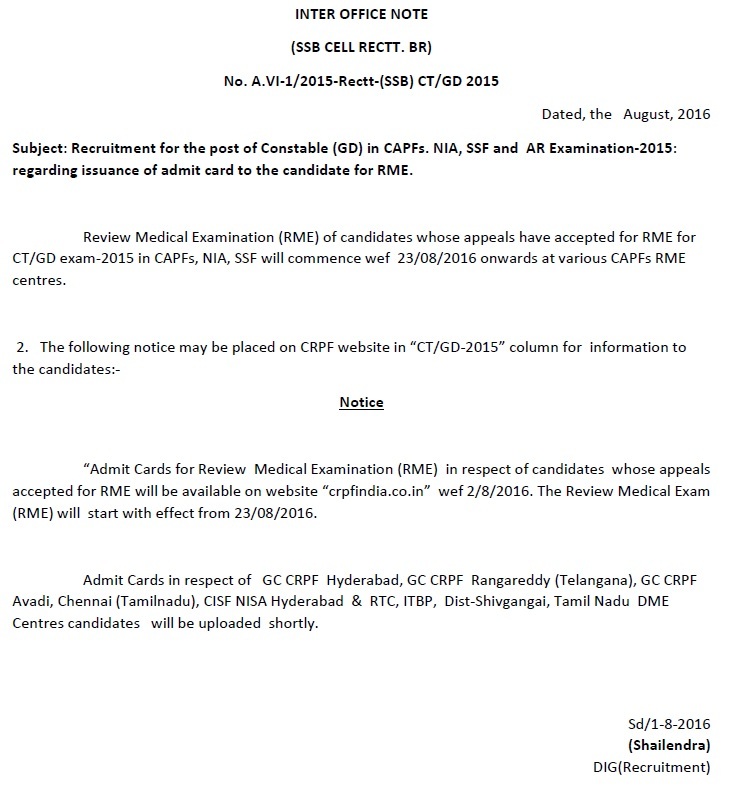 Detailed Medical Examination (DME), Review Medical Examination (RME), Force Allocation of selected candidates, etc. will be handled by the Co-ordinating CAPF-CRPF. SSC GD Constable RME / DME admit card will be available at above given links. The candidates can download their admit card from SSC website from here Also candidates should check the details given on admit cards to find any discrepency. 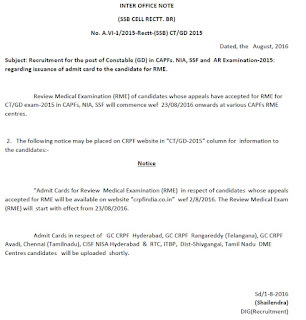 After conduct of RME/DME (Medical examination), the Commission will process and declare the final list of selected candidates state-wise without making Force allocation. Based on such merit list declared by SSC, MHA/ CRPF will make force allocation, etc. and declare the final result. Those who got selected for these posts, will be given Pay Band – I, Rs 5200-20200 + Grade Pay Rs 2000/-. Candidates are required to submit domicile certificates of their state at the time of medical examination/documents verification failing which their will not be allowed to undergo medical examination and their candidature will be cancelled. In order to download the admit card for SSC GD Constable Medical exam, candidates need to visit the direct link provided here (after release). It will take you directly to download page. Then candidates need to enter their registration details and click submit. Their SSC GD Constable Medical Admit card 2016 will be shown having the centre details and roll no. etc.